We are told that she is a shepherd mix. Her name is Zelda and she is beautiful! We get all kinds of comments on her. anyway - she is very loved and the little dickens made us fall in love with her at the shelter and - we have to say, that she is a keeper! What a beautiful little girl your little Zelda is! Thanks so much for sharing her with us. Like many other things in life, these little GSD mix puppies and dogs are wonderful little furry surprises. Never know how they're gonna turn out to be until they're all grown up. But what a sweet little present they are! Oh, before I forget, thanks so much for rescuing her in the first place. If more people did that then maybe we could close down a lot of shelters! Wouldn't it be a wonderful world not to have a need for them in the first place? 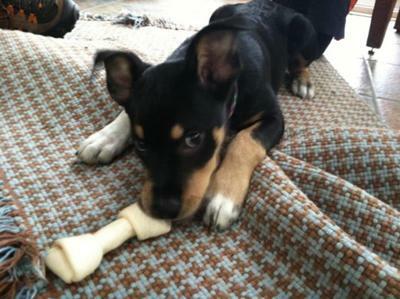 Way to go Zelda you cute little German Shepherd mix, you! Congratulations on the new edition and look at that precious little puppy face, just a cutie! Zelda looks like a "little dickens" in that photo. Sounds like Zelda has a loving home and people who adore her. The puppy year is Wonderful and so important enjoy it as long as you can, even though it is work, training, teaching, etc it is worth every moment, the bonding, holding my baby in my arms, ah I wish one more time. Good Luck with your puppy Zelda and may God keep her safe and healthy.